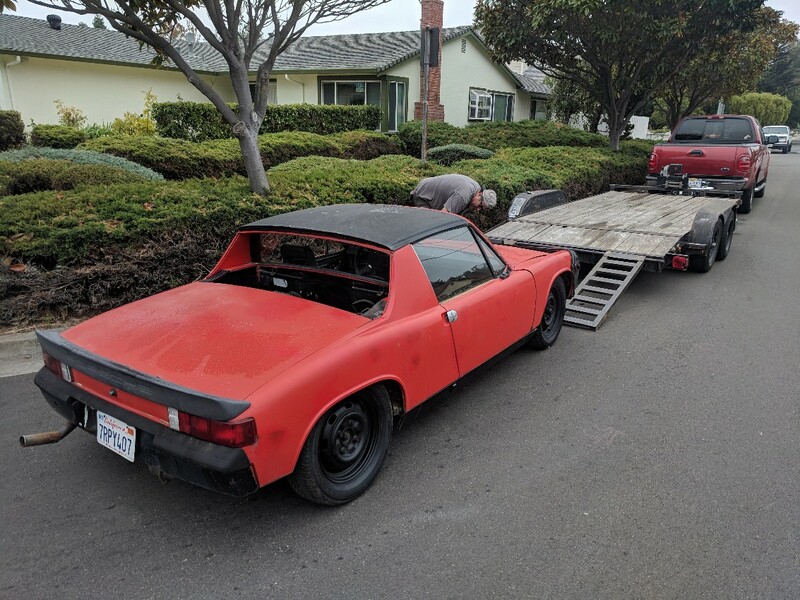 New 914 owner! Already dreaming of engine swaps..., What would you guys think about a 4A-GE blacktop in a 914? A little background: I have 3 cars besides the 914: A stock '00 Boxster, a restored '86 E30 BMW with a 2.8L stroker M20, and a '06 Outback XT. All manual trans. I found this 1972 914 1.7 on craigslist for $1600 and the main selling point to me was that most of the parts were there, it just seemed to need some basic TLC to get it running. Also, its a California car and not a total rust bucket. Also hasn't appeared to be in any major accidents. After pretty much finishing my E30 I've been itching for a new project... Ideally smog exempt. The plan for the car is to get it running with the original type 4. The PO, who only had it for a few months, said he thinks it needs a fuel pump... turns out, the fuel pump wasn't even plugged in. So OF COURSE it's not running. He got it to start briefly with just starter fluid, so I'm thinking that's pretty much it. I'm going to bring it back to stock configuration on the D-jet, change out the oil and fuel, plug in the dang fuel pump in and I pretty much expect it to start up no problem. From there, I will get into the restoration phase. Take it down to bare metal (I believe the car was originally black, and has total crap paint job) tackle any rust, then repaint. Then get the interior/ exterior trim all sorted. And, if I get through alll that... I will probably want to undertake a motor swap, unless I'm just in love with the type 4. I tossed a few ideas out there, but my ideal motor would be a light, high revving motor with ITB's. Since S14's are not exactly obtainable, the 20V 4A-GE blacktop is my best idea so far. KEP makes an adapter for it, plus, it doesn't make enough power to break the stock 901 trans. I am a mechanical engineer with access to a machine shop, so fabbing some engine mounts, routing cooling system etc will most likely be pretty doable. What do you guys think? Am I in over my head? I had to look up what a 4A-GE blacktop is, but you're definitely not in over your head. 914's have been swapped with many different motors, so an easier route would be to copy what's been done already.. but that's totally up to you. Fix it up and drive it first is a great idea, though. You'll get tired of the T4 soon enough, but will love the handling, etc. Looks like a great starting point. Thanks for all of the welcomes! I hardly got that on r3vlimited, haha. The 4A-GE is a Yamaha designed Toyota motor made famous by the anime initial D. It's found in the AE86 corolla and the original MR2. The blacktop is the final iteration of the motor, found in some JDM only FWD corollas from the late 90s. It's a 1.6L I4 making 160 hp. Redline is at 8300. 5 valves per cylinder. 11:1 compression. Comes stock with individual throttle bodies and runs off a MAP sensor. This makes fitting it with open air trumpets a bolt on affair. It might just be the best sounding 4 cylinder ever made- in my opinion. I def know it would not be as easy as a subaru or V8 swap. Not the biggest fan of V8s so the subaru motor would probably be the easiest choice for me. Anyways.. hopefully I get it running soon. I'm thinking it could be as soon as this weekend. I haven't actually attempted to start it since I got it, haha. A blacktop is nice but parts are getting harder and harder to get. I just did one in an AE86. I would look into a K series if you want a reliable powerplant with inexpensive parts. My guess is the height of the engine might be an issue, most people use a boxer engine because it's close lawn and keeps the center of gravity down low. I definitely considered the K series motors. Its no doubt the more practical option.. cheaper, can make much more power, more reliable even. The only advantage the 4AGE has is size, sounding better and being a cooler swap. And that pretty much does it for me. But I'd no doubt have to get some seat time in like a Civic Si or RSX type S or something, to see if I'd like that motor. I did love the sound of the ITBs screaming but you can get that same sound from a K20 with ITBs. The thing that really hurts the blacktop and silvertop swaps is the water line issue. I ran the RS Chita setup in my 86 which made life easy at the price of $400. I looked at the SQ engineering kit but it was still a bit too rough for my taste. At least you won't need to relocate the dizzy so that saves you a few $$. If you do decide to do a BT20v let me know as I have a brand new set of performance spark plug wires I imported sitting on a shelf for it. No idea about that motor you want, someone has done the K-motor swap before, I tried to search for it, yet cannot find it. Not really hurting it too much, seeing as multiple shops make kits to relocate the water lines.. Some I see are as low as $200. Unfortunately the ITBs for a K20 cost more than an entire 4AGE engine. Some of the Honda ITB kits actually use blacktop throttles with an adapter, lol. And good sound is not guaranteed... it's likely that the blacktop partially gets it's unique sound from having 5V per cylinder. I kinda want a drop in solution where the most engine modifications I'm going to do is cams and a valve job. Sure I can get the K motor up to 300 hp at the wheels, all motor. But at that point, I'm breaking my transmission if I use first gear. And in it a lot more $$. Another thing, is that the toughest part of my E30 build was not swapping the motor, but getting the thing tuned right. I went through 3 sets of injectors, adjustable fuel pressure regulator, wideband O2 sensor, a bunch of crappy AFMs and 3 different tunes. It's still not 100% perfect, idle is a little wonky sometimes (probably because of the cam) and sometimes at WOT it will hesitate. I'll probably do a megasquirt with it eventually, but that's $$ plus dyno time which means more $$$. I imagine I'll have my hands full with just the swap for my 914- I'd like modifications to the motor to be another project.. but in the distant future. That's good to hear! I've already met some friendly 914 folk in the area buying some parts on craigslist. I got an engine cover in the exact crappy faded repaint red and a rebuilt side shift trans with custom linkages. The shifter in this car is the absolute worst I've ever felt, I literally got the trans the day after I bought it lmao. I was like... where are the gears? Then I realized the entirety of the movement in the shifter was slop. I was almost impressed. "The plan for the car is to get it running with the original type 4. The PO, who only had it for a few months, said he thinks it needs a fuel pump... turns out, the fuel pump wasn't even plugged in. So OF COURSE it's not running. He got it to start briefly with just starter fluid, so I'm thinking that's pretty much it. I'm going to bring it back to stock configuration on the D-jet, change out the oil and fuel, plug in the dang fuel pump in and I pretty much expect it to start up no problem. From there, I will get into the restoration phase. Take it down to bare metal (I believe the car was originally black, and has total crap paint job) tackle any rust, then repaint. Then get the interior/ exterior trim all sorted. " Do this. That's enough....you've got other cars, but you asked. Change the tailshift to a side shift and be done. Hello from San Jose. I just finished up my WRX swap, feel free to ping me with any questions. You're welcome to come by and check out my build too, Im in the Cambrian area. A 16v 4AGE with ITB's sounds exactly the same as a BT 20v with ITB's, I've built both. The 5 valve per cylinder sounds cool until you realize almost all of them need valve guides and sometimes valves (very common issue). If I knew how much of a pain the BT swap was I would have built another 16v and saved myself some cash and made more power. Those $200 water line kits are a joke, most of them run a steel pipe right over the top of the exhaust header and right under the ITBs or worse have you grind out part of the casting in the head which creates it's own separate issues. You can buy a K20 for about the same amount as a BT 20v and have motor that will run like a swiss clock right off the crate and make more HP stock (and WAY more torque!) than a BT 20v does heavily modded. You also have a huge community to look to to get good prices on used parts (like ITBs) and technical support. You also can get service parts at any parts store in the US. You won't be stuck dealing with the price gouging and vultures over on Club4ag. Had I not gotten such a killer deal for my Honda V6 swap, I'd go with a newer VW 2.5 liter 5 cylinder and bolt it up to a 5 speed Boxster/Passat box. No silly adapters or custom flywheels. That motor would sound sweet with some ITB's for sure.